As shown in Figure 27.1, an online version of the API is available at api.freenas.org. A new API was released with FreeNAS® 11.1. The previous API is still present and in use because it is feature-complete. 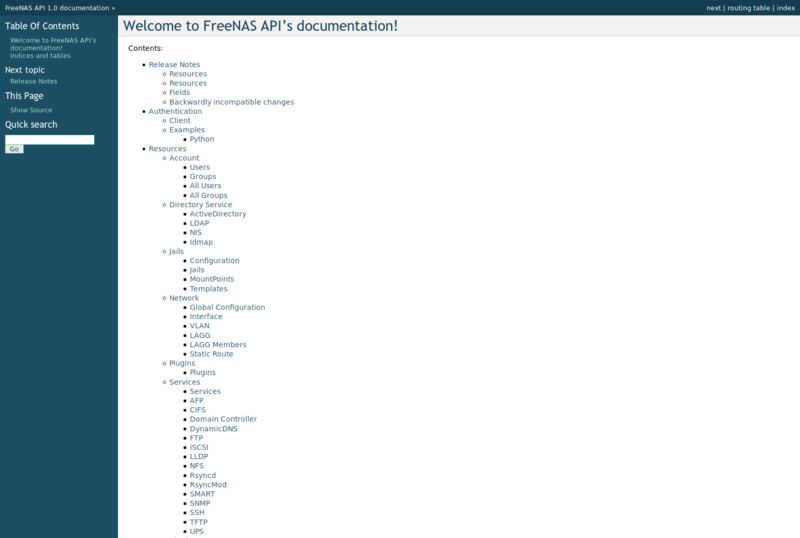 Documentation for the new API is available on the FreeNAS® system at the /api/docs/ URL. For example, if the FreeNAS® system is at IP address 192.168.1.119, enter http://192.168.1.119/api/docs/ in a browser to see the API documentation. Work is under way to make the new API feature-complete. The new APIv2 uses WebSockets. This advanced technology makes it possible to open interactive communication sessions between web browsers and servers, allowing event-driven responses without the need to poll the server for a reply. When APIv2 is feature-complete, the FreeNAS® documentation will include relevant examples that make use of the new API. A FreeNAS® system running at least version 9.2.0 is required when creating a customized script based on this example. To test the scripts directly on the FreeNAS® system, create a user account and select an existing pool or dataset for the user Home Directory. After creating the user, start the SSH service in Services ‣ SSH. That user will now be able to ssh to the IP address of the FreeNAS® system to create and run scripts. Alternately, scripts can be tested on any system with the required software installed as shown in the previous section. To customize this script, copy the contents of this example into a filename that ends in .py. The text that is highlighted in red below can be modified in the new version to match the needs of the user being created. Do not change the text in black. After saving changes, run the script by typing python scriptname.py. The new user account will appear in Accounts ‣ Users in the FreeNAS® web interface. Line 4: replace freenas.mydomain with the Hostname value in Network ‣ Global Configuration. Note that the script will fail if the machine running it is unable to resolve that hostname. Go to System ‣ General and set the Protocol to HTTP. Line 7: to force validation of the SSL certificate while using HTTPS, change False to True. Lines 8-16: set the values for the user being created. The Users resource describes this in more detail. Allowed parameters are listed in the JSON Parameters section of that resource. Since this resource creates a FreeBSD user, the values entered must be valid for a FreeBSD user account. Table 27.1.1 summarizes acceptable values. This resource uses JSON, so the boolean values are True or False. bsdusr_username string Maximum 32 characters, though a maximum of 8 is recommended for interoperability. Can include numerals but cannot include a space. bsdusr_full_name string May contain spaces and uppercase characters. bsdusr_password string Can include a mix of upper and lowercase letters, characters, and numbers. bsdusr_group integer If bsdusr_creategroup is set to False, specify the numeric ID of the group to create. bsdusr_creategroup boolean Set True to automatically create a primary group with the same numeric ID as bsdusr_uid. bsdusr_mode string Sets default numeric UNIX permissions of a user home directory. bsdusr_password_disabled boolean Set to True to disable user login. bsdusr_locked boolean Set to True to disable user login. bsdusr_sudo boolean Set to True to enable sudo for the user. bsdusr_sshpubkey string Contents of SSH authorized keys file.